I am fascinated by the historical summaries found in the Bible. Several times in the Old and New Testament you see a re-telling of former events. Moses did it several times. Jesus did it on the road to Emmaus. Paul and Peter do it in the book of Acts. Why are these re-tellings recorded in the Bible? We don’t need them today since we have the whole Bible. Why did God choose to leave those parts in the pages of Scripture? I believe these historical summaries are left in the Bible to show us a very powerful way to share the story of the Savior. God promised the future Redeemer back in the third chapter of Genesis. Throughout the Old Testament that promise was restated often and the coming of the Messiah was pinpointed with more refined accuracy. In the original promise (Genesis 3:15) any one of Eve’s children could have been the Savior. However, as the Old Testament progresses we see that the Redeemer would be a male Jew from the tribe of Judah. This was told through the promises given to Abraham, Isaac and Jacob. Further, the promise was refined to pinpoint a specific place and time where the Messiah would be born. (Genesis 12:1-3; 49:10; Micah 5:2 and many other verses). The Old Testament gives a very accurate picture of who Christ would be. When He came on the scene in the New Testament, it should be no surprise to someone who has read and understood the Old Testament. Jesus was the promised Messiah that the world had awaited since the fall of Adam and Eve. When you use the Old Testament stories to teach about the Messiah then you eliminate many of the cultural differences that are found in the world. Whether you are talking with someone who has a great understanding of the text of the Bible, or someone who has never heard of God, using the progression of the Old Testament you can share the Gospel. By teaching about Christ this way, many cultural differences and potential misunderstandings are erased. You are teaching about Christ in the same way God chose to reveal His Son. If God thought it was good to teach us about Christ in this way, then you can be assured that it is a great way to share Him with others. If you are teaching the Bible in a place, or to a people group who have had no previous exposure to the Word of God, then you are teaching from the cultural context that God used to reveal His plan. Many stories in the Bible can be misunderstood (and have been through the ages) when taken out of context and when not compared with the Bible itself. Teaching chronologically through the Bible eliminates this potential confusion. One of the ten commandments says to have no other gods before the true God. Another says that we should worship God only. What other gods can there be and which ones would come before the true God of Heaven? Because of not knowing the Bible as a whole, people and religions have created many gods supposedly based on the Bible. You need to teach the whole Bible so that people can see who the God of the Bible really is. Don’t allow those you are teaching to create their own god. People do it all the time. But teaching the Bible as a whole book you will be teaching them who God really is. As with breaking down cultural misunderstandings, when you teach Old Testament Bible stories you bring everyone in line with the background and point of the story. Wouldn’t it be strange to listen to only the moral of a story without hearing the story that accompanies it? Yet we do this with Bible stories all the time. For example, you will hear preachers make comments such as, “It is wonderful to see the deliverance of God in the life of Daniel.” If you know the story of Daniel in the Lion’s Den, then it really is wonderful to see. However, without telling the story that goes with the deliverance, then it really does not help anyone. Make sure you share the whole story with those you are teaching so that you know they have a full understanding of the story and they understand it in the way God intended. Don’t just apply the story without giving the background and the context. In their book Made to Stick, Chip and Dan Heath talk about making ideas stick in the mind of others by using stories. God has done that throughout history with His Word. God has given us stories to help us understand what He wants to teach. Doesn’t it make sense for us to do the same? If you want people to understand God’s Word and His plan, then take time to tell the stories that He has chosen to share. They certainly are sticky. They will be remembered. Do You Need to Teach the Whole Bible? Does this mean that before a person can be saved they must read and understand the whole Bible? No. However, the more a person can be taught from the Word of God, the more likely they are going to understand their need of a Savior and become hungry to learn about Him when He is revealed in the New Testament. One time I taught through the Old Testament and then the life of Christ in several months to a group of Deaf on the mission field. When they each realized their own personal need of a Savior, there was no confusion to them as to who Christ was and why they needed Him. They had seen through the Old Testament that God had absolute authority and power, that man had sinned and needed a Savior, that God had promised a Redeemer and that the Savior could forgive their sins. As soon as Christ was revealed in the teachings of the New Testament my students were excited to learn about the Savior and exactly how He was going to save them. The sacrificial death of Christ on the cross and His resurrection were exciting and convicting to those I was teaching. Needless to say, each one knew who Christ was and exactly what salvation meant for them. If they rejected Christ (which none of them did) they also knew who they would have been rejecting. 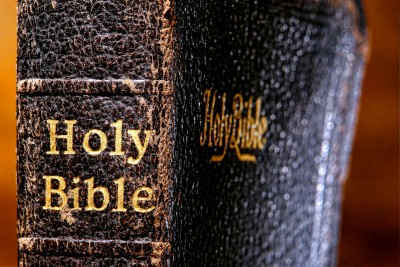 Use the Bible as God has given it to us. It is a whole book intended to be learned and taught as a whole. Obviously someone would not need to understand everything in the Bible to understand their need of salvation. However, they will have a greater appreciation and understanding of Christ if they see how He is progressively revealed in the teachings of the Old Testament. Sharing Christ with people by using the Old Testament stories is a powerful way to witness. God gave us the Old Testament accounts that point to Jesus as the Redeemer so that we can teach them in any culture. When we start in the Old Testament and teach chronologically much confusion is eliminated and those whom we are teaching are more apt to fully understand who Christ is and when they meet Jesus in the New Testament they know that He is the Messiah — the promised Redeemer. By the time your students (or anyone whom you are witnessing to one-on-one) get to the New Testament they should understand their need for a Savior and choosing Jesus will be most appealing. I absolutely loved this article. God has actually been working on me lately about the importance of the Old Testament in witnessing and in teaching. I have often wondered why we so often neglect the Old Testament even though it is a much larger portion of the Bible than the New Testament. You have certainly inspired me and, I believe, given me a message from the Lord. God bless you, brother. Amen to this sterling work David. I believe that we miss out when we fail to use the whole Bible. I would have loved to be in that inner circle of Jesus’ teaching on the road to Emmaus. Can you imagine hearing that study!? Thank you for this reminder that all Scripture is profitable. In Isaiah God mentions His unique ability to foretell the future which He has evidenced through His servants/prophets. He thus validates 1) Himself as the only God and 2) His servants as true prophets. At the same time He launches a polemic against the “wannabe” religions saying they cannot make such claims or demonstrate such abilities. He adds that it is folly to place one’s faith in such phonies. The end of such folly will be destruction. This is a message which needs to be directed to the 19-35 demographic. Secular humanism has no comeback to such.